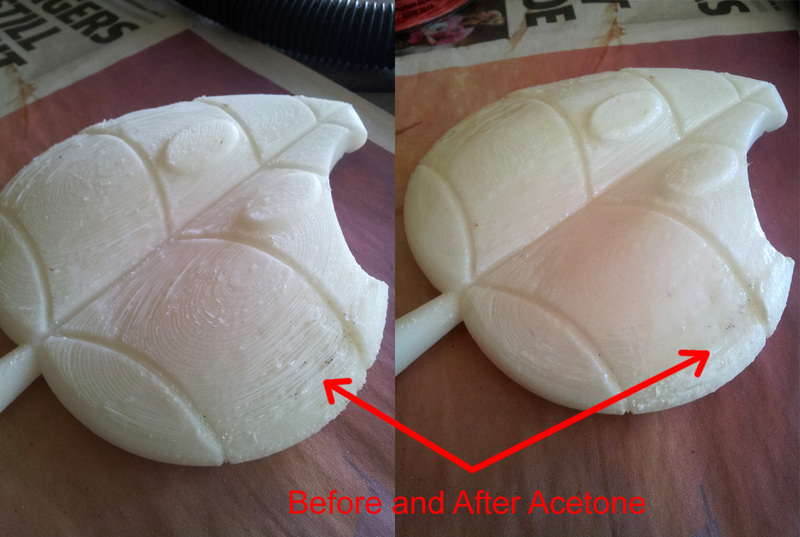 I’ve written a few times now about my experiments using acetone to smooth rough surfaces (see this post about my first test of brushing acetone directly onto a surface). This 3D print is the leaf for the center of my Mario Kart Trophy. The side pictured is the bottom side of the print, i.e. the side the support raft was fixed to. As you can see in the first photo it’s quite rough, particularly around the perimeter where the raft stopped and the overhang resulted in some loose layers. I really thought I’d have to print this again, thinking no amount of sand paper or anything else could smooth these surfaces as the loose hairy strands would simply fall off, leaving big gaps in the surface. Enter acetone, hero of the day! Within about 1-2 minutes of brushing acetone directly onto the problem areas, the layers have dissolved and smoothed themselves out into an almost perfect surface. By using a stiff bristled brush you can actually feel the surface go tacky, and control the outcome. I’ve used acetone across this whole back side to fix up a lot of the problems – it’s really like a magic wand or blur tool in Photoshop! A must have for any 3D printers’ kit.